Well today I have wanted to make a Monochrome Christmas card. So here is my card that I made for the crafter's companion blog challenge Embossing. I got the ribbon and the black candi from my own stash. This is so effective and love the cute bows on the embossed baubles. this is very beautiful and elegant Sam. Fabulously elegant Christmas card, beautifully embellshed. 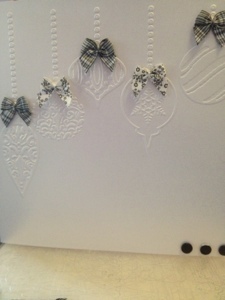 Beautiful card - love the embossing and the pretty bows - really effective - love it! !